How stable is the state of information storage on the planet today? How much do you know about the life of your great grandfather? How much of your own past would you remember if you lost all access to your personal data? And how likely is it that all of the world’s information could be lost? In recent past we printed out copies of paper or burned CDs or DVDs to back up information stored online or in computers. But now the trend is to digitize as much information as possible and go ‘paperless’. We make ourselves feel better by creating ‘backups’ and making our systems ‘redundant’, but how stable are these information systems, really? If for example, one file was damaged via corruption, every time it was copied thereafter, it would be a copy of the corrupted file. When you went to restore the file from a burned CD, you may find that the tiny ‘pits’ on the CD have decayed and the CD is no longer readable. Or when you went to access the information, you found that it was stored on a medium that is no longer accessible (such as a floppy disk, which is only readable from a floppy drive) or a file type that requires a computer program or operating system that no longer exists. While the latter type, what I’ve aforementioned as The White Album Problem, can be overcome through a constant and persistent ‘copy, transfer, and upgrade’ cycle, it doesn’t account for the former type which is bad data and certainly doesn’t overcome the Worst Possible Outcome. The Worst Possible Outcome is that we, as a society have digitized all of the world’s information and stored it on electronic information systems that run on electricity. There are no paper copies of any information, but it is all available at our fingertips. Humanity rejoices! But then one day a freak solar flare from the sun bathes the earth in electromagnetic radiation, destroying all electronics, and plunging us into total darkness. There are no paper books, no paper maps, and no paper manuals on how to put Humpty Dumpty back together again. But the knowledge loss wasn’t limited to the rockets. After the Apollo program was ended, the crawlers used to move the Saturn V rockets were set aside and those who built them moved on to other projects. When the Space Shuttle project was first growing, NASA had to spend large amounts of money putting the crawlers back together, because the technology had practically been lost. In the May/June 1973 issue of Saudi Aramco World, Richard W. Bulliet wrote in “Why They Lost The Wheel”, “Eastern society wilfully abandoned the use of the wheel, one of mankind’s greatest inventions,” opting instead to use camels, which were more suited for travel than the horses and chariots used earlier in Egypt and Rome. Damascus Steel swords, which were generally made in the Middle East anywhere from 540 A.D. to 1800 A.D., were sharper, more flexible and harder/stronger than other contemporary blades. They were also visually different, having a marbling pattern called “damask,” that hinted at a special technique/alloy. But production gradually stopped over the years, and the highly-guarded technique was lost – no modern smiths or metallurgists have been able to definitively solve the techniques/alloys used in forging those swords. How does information get lost? Information is inherently fragile. There are many ways that it can be lost. From data corruption to fire to war to flooding to electromagnetic pulse to the simple act of forgetting to record the information in the first place. The latter is the most common and most dangerous of them all. At NASA (and other large [and small] organizations) there is a ‘group think’, shared-brain mentality where the corporate knowledge of the organization is enough to get by during finite periods of time. Organizations can operate as long as there is not too much turnover or brain drain. But what happens when a large portion of the workforce retires at the same time, or a region suffers a local catastrophe, or information is not thought to be needed now, but may be very important later? What happens when the information is never recorded in the first place? Have you ever heard the term “Recorded History“? Have you ever wondered why there seems to be a time in history when there is no written record of any events before that time? What could have happened to prevent knowledge transfer? It could be false pride that is leading us to believe that we are the only generation of humans to get to this point in technological evolution or it could be that previous generations digitized there information to the point where no historical evidence of them now exists. If someone a hundred years from now was tasked with proving you existed, what information would they use to prove that point? Would they rely on government databases? An abandoned Facebook account? What if there were no computers? No Internet access? How then? The reason we know even what we know now about Jesus, famous leaders, and former Presidents, is because people wrote this information down on a piece of paper and someone copied it. When computers came along, the information was digitized and copied further, but if we stop copying, the information stops. When the Bible was being copied by ancient scholars, there were error correction measures put in place to ensure that verses were copied exactly as intended. What memory correcting mechanisms do we have for modern day digital photographs, documents, and other digital information? In general, things people care about the most are printed, backed up, copied, and distributed, but sometimes events conspire to erase even the most important information. Information is inherently fragile and we must always be vigilant to keep that which is most dear to our hearts. The first job I ever had was in during high school at a fancy restaurant called Heiskell’s Restaurant and Lounge. I washed dishes 3 nights a week (Thursday, Friday, and Saturday). Although I worked there with several of my friends, it was still one of the worst jobs of my life. For 3 years I traded my precious weekend evenings washing someone else’s good times down the drain, but it’s from this literal pit of despair that I learned all I really needed to know about business process management or BPM. “Good design reduces the number of problems,” for the rest of the night. “Whether or not existing processes are considered, the aim of this step is to ensure that a correct and efficient theoretical design is prepared.” The flow you develop washing the pots and pans, getting a feel for the water hose, dealing with interruptions from the chef, and preparing for deadlines (“We need more cups!”) will help you meet the service level agreements you and your business have made with the customer. While plates stack nicely in a tray, silverware lay loose in a tray and need sorted after they come out of the washing machine. As a result of this process, silverware is saved up and ran only when the tray is full (or when we need more silverware washed to meet demand). This creates a “packet size problem” that exists in everything from Internet traffic to Items Processing runs. In business process management, we call the study of figuring out the best way to do something, Optimization. “Process optimization includes retrieving process performance information from modeling or monitoring phase; identifying the potential or actual bottlenecks and the potential opportunities for cost savings or other improvements; and then, applying those enhancements in the design of the process.” Based on those inputs, “Recommendations will be made that overall creates greater business value.” Over time a dishwasher learns the optimal number of silverware per tray. “The degree of monitoring depends on what information the business wants to evaluate and analyze and how business wants it to be monitored, in real-time, near real-time or ad-hoc. Here, business activity monitoring (BAM) extends and expands the monitoring tools in generally provided by BPM. Time studies can also depend on whether or not the business consultant is recording times as they are or as they should be,” which every dishwasher who’s ran a Hobart knows well. In the end, it’s all about Execution. “In practice BPM analysts rarely execute all the steps of the process accurately or completely. Another approach is to use a combination of hardware and human intervention, but this approach is more complex.” It doesn’t matter how good your procedure is, sometimes the silverware tray tips over in the bottom of the Hobart or the garbage disposal gets clogged. No matter what, you’re going to have to stick your hand down in a deep, disgusting, wet hole. “As a response to these problems, BPM processes have been developed that enables the full business process (as developed in the process design activity) to be defined in a way to improve business operations. Compared to either of the previous approaches, directly executing a process definition can be more straightforward and therefore easier to improve. However, automating a process definition requires flexible and comprehensive infrastructure,” which is something a dishwasher knows well. Business Plans – Are They Worth It? I’m not a big fan of business plans, but apparently that’s not always been the case. 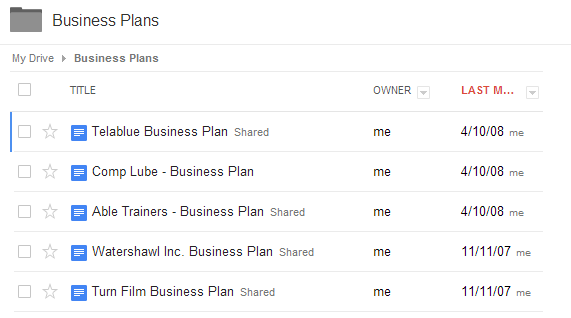 In my Google Drive there is a folder called “Business Plans”. Inquisitively I clicked on the folder to see what it contained. My last modification was on April 10, 2008 (6 years ago). None of the five businesses listed are still in existence and only two of them ever made money. I thought it’d be fun to open them up to see what I wrote. The idea was to create courses on basic computers, the Internet, and Microsoft Office applications. Our target market was “small businesses and suburban schools.” Phonebooks. Business cards. Paper flyers. This business plan contains a logo and the words, “Sustainable computer repair.” I’m not sure what that means. I ended up giving the rights to this company to a former employee, who never used those rights. Like Comp Lube, this plan is nothing more than a logo and the words, “Film editing and conversions.” At least it actually described what it did. The idea was a “VHS to DVD” service, which dates it pretty well. Watershawl was a “new media company specializing in computer services and design.” That’s pretty much true to what it was. I did a lot of web design and IT work, but what I loved doing was process management. Planning is useful, but I’m not so sure the actual document is useful. It can be used as a way to flesh out ideas, but it doesn’t have to be a long document. One page should be enough to state what you’re doing, how you’ll make money, and who your target audience is. A business plan is usually all made up numbers, but it’s easy to feel like you’re building your business by writing a business plan instead of actually trying to Sell First. Customer development is one way to figure out whether or not someone will buy what you are selling. I’ve spent the last year and a half helping one of my customers develop a business plan while another customer has already sold tens of thousands of products. Not all companies can be bootstrapped I realize, but the sooner you can validate your idea, the better.